Periodically, I visit a studio of a fellow artist and as to be expected it is set up in a way to satisfy his artistic needs. There is a series of sky lights facing northeast and a large window east, south-east. The set-up for the model is quite simple but the dual direction of the light sources is difficult. I struggle in my drawings or paintings with maintaining a sense of a directional light source. Many times, on sunny days, both sources have an equal intensity. Most times, I have chosen one source or the other as the dominant point of light. Another added difficulty is the color temperature of the two light sources- one being more direct and therefore warmer and the other more indirect and therefore cooler (although, this changes as well with the seasons as the sun moves its position in the sky). I decided to tackle this problem straight on and deal with both light sources equally and study the color temperature differences that occur. This sunny June day found the light as such: The sky lights had a warm directional light because the sun was coming in at an oblique angle directly and this light was to one side of the model and slightly behind; on the other hand the large window was receiving indirect light but was directly opposite the figure creating a definitive coolness on one side of the model. As the model was placed in the space, one side was receiving the warm light from the sky light and the other side was receiving the cool light from the window. Both sources were opposing one another with the core shadow and darker shadow edge running through the middle of the figure. This was really the best position to study these opposing color temperatures. I began by choosing a gray sheet of Borden Riley charcoal paper of a middle value. I intended to leave the cool gray of the paper as an indication of the cool light source. 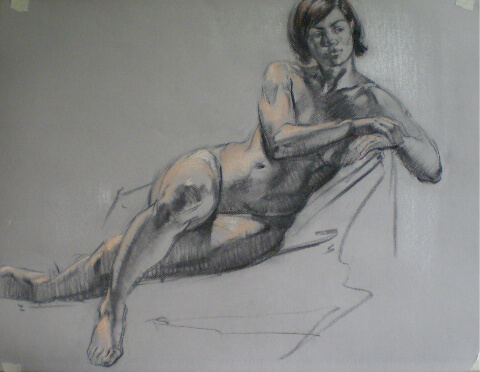 I sketched the figure with medium vine charcoal, building the armature, making comparisons of relationships and of proportions and drawing the revisions. Next, I built the forms keeping in mind the anatomical landmarks and allowing the rhythm of the forms to relate to the over-all rhythm of the figure as a whole. After completing this first stage of the drawing, I started to plan the pattern of light and shadow and the differences of color temperature between them. Since the warm light was more direct, I chose this source as the dominant point of light- this would be the light side of the figure. And since the cool light was indirect and not as intense, I chose this secondary light for the shadow side. The division between the two, which was darker, would indicate the core shadow as well as the shadow edge. This is where I began- in the interior of the figure looking carefully at the specific shape of the shadow edge. This created the necessary division between the warm light source and the cool reflected light on the shadow side of the figure. Next, I chose three pastels to work the light side of the model- a cool white, a warmer white and a warm mid-tone flesh color for the half-tones. I began with the warmer white and used it to indicate the general source of the light- reducing its application as I approached the half-tones, leaving some cool of the paper to show through. Next, I indicated the warmer half-tones near the shadow edge that were of a lower value than the general light. These did not touch the shadow edge, leaving the gray tone of the paper to abut the shadow. Lastly, I applied the cooler white for the highlights. Next, I worked the shadow side of the figure allowing the cool gray tone of the paper to act as the cool reflected light within the shadow. I did not use any pastel on this cool side. I used the charcoal in varying degrees to indicate the value changes occurring and left the coolness of the paper in areas with a stronger, more intense reflected light. Next, I added dark accents as well as lost and found edges. And lastly, I felt I needed some tone in the hair to off-set it against the flesh and added a warm dark in its mid-tones. This study allowed me to solve many of the issues I faced in this particular situation and will assist me in future projects there. But, it also showed me how important color temperature is to achieving a sense of form. Robert Henri believed that, “Form can be modeled in black and white, but there are infinitely greater possibilities in modeling through the warmth and coolness of color.” (Henri, The Art Spirit, p.62) Through this experiment, I found that even more true than I first realized. you used. You make it sound and look easy!